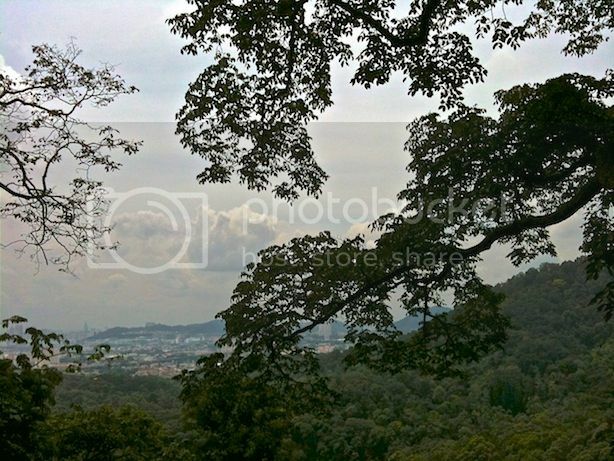 I first walked the Canopy Walkway at FRIM (Forest Research Institute Malaysia) in Kepong back in March 2009. At that time I had acrophobia. I still have acrophobia, though I think it's not as bad as last time. In case you do not know what acrophobia is, that's the term for a fear of heights. 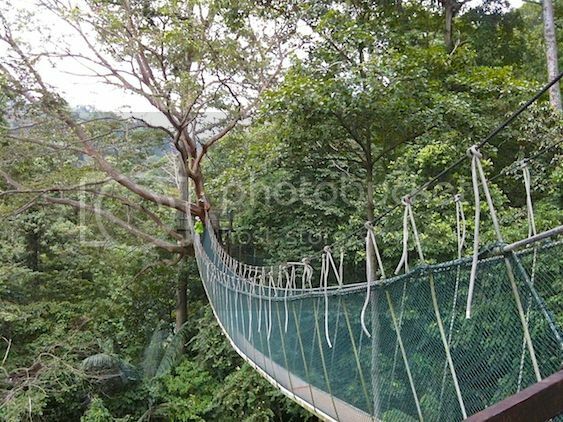 The Canopy Walkway at FRIM is actually a suspended bridge about 30 metres above ground. I first attempted to walk this canopy back in 2009 to cure my fear of heights. Although it did not totally cure my acrophobia, I must say it did help me manage it better. Last Thursday, I decided to make a second visit to this Canopy Walkway. It's been more than 4 years now - how time flies! 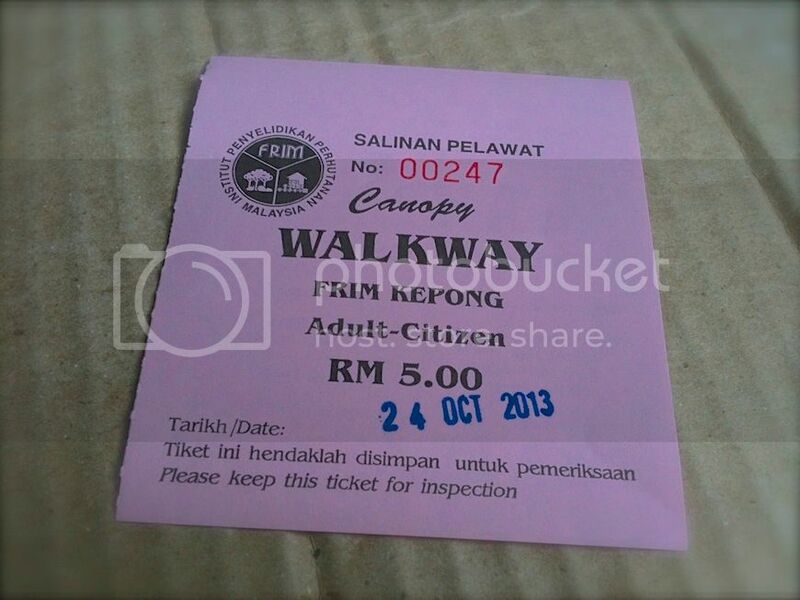 The ticket for the Canopy Walkway was RM5, exactly the same price 4 years ago. I'm glad they did not raise the price! Just like my first attempt in 2009, I was doing this alone. No one wanted to join me. Maybe because it was a working day. Or maybe most of my friends have acrophobia like me, and they did not think walking on a suspended bridge is fun. I drove to FRIM around 10am in the morning. Since FRIM is not a public recreational park, but a R&D institution that opens its campus door to the public, a fee must be paid at the guard house to enter. Cars without stickers are charged RM5 - that's the amount I needed to pay. 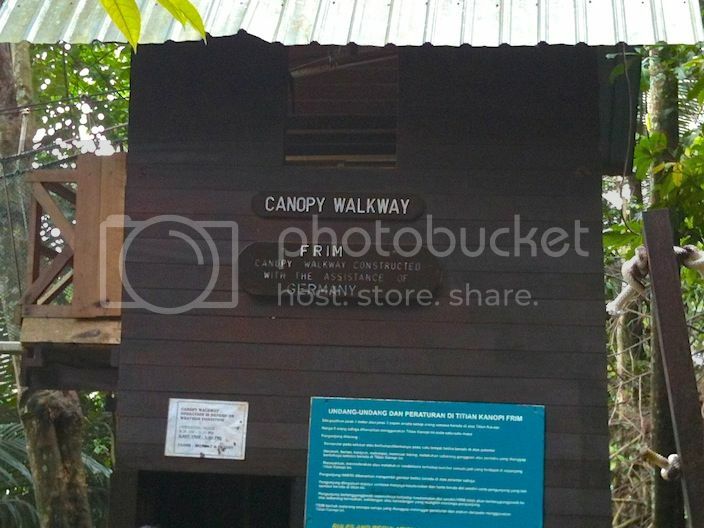 (Do not confuse this RM5 entry charge with the RM5 canopy walkway ticket in the photo above). Oh, found an empty parking space between 2 cars! Perfect! After parking my car, I walked over to the FRIM's One Stop Centre (which is also where souvenirs are sold) to purchase the ticket for the Canopy Walk. 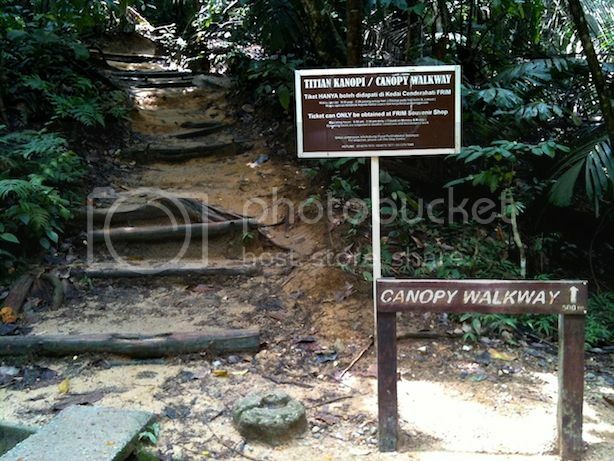 Remember, you need to buy tickets before proceeding to the Canopy Walkway or you won't be allowed access. For a group of 10 persons or more, advanced bookings are required. Refer to the email and contact number at the bottom of this post. 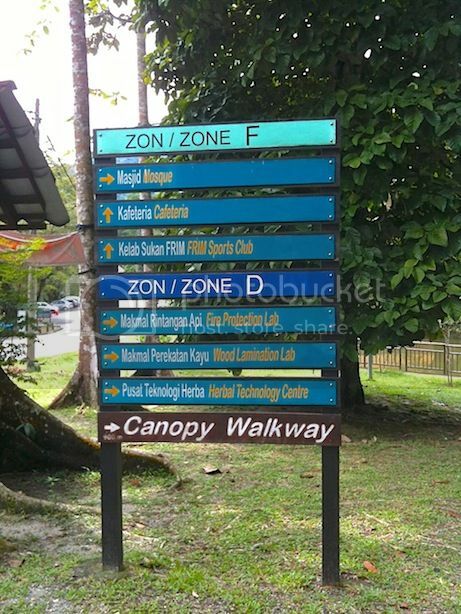 There's a signboard showing you direction to the Canopy Walkway. Just follow it! 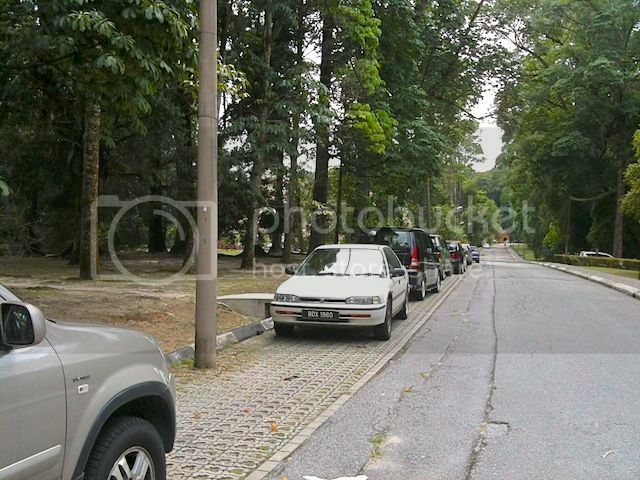 After passing a mosque on my left, I reached the starting point of the Rover Track. This is a track mainly for joggers. I used to jog here last time, but I have since stopped doing so as FRIM was a little bit too far from my place. But walking or jogging in the parks and forests is a must for me as I found it to be relaxing and rejuvenating. That's why I never run on treadmills in the gym - those machines are only useful if it's raining outdoors! I did not bring my camera with me - I thought it was too much trouble! So I took all the photos here with my iPhone 3Gs, hence the not so good quality photos. 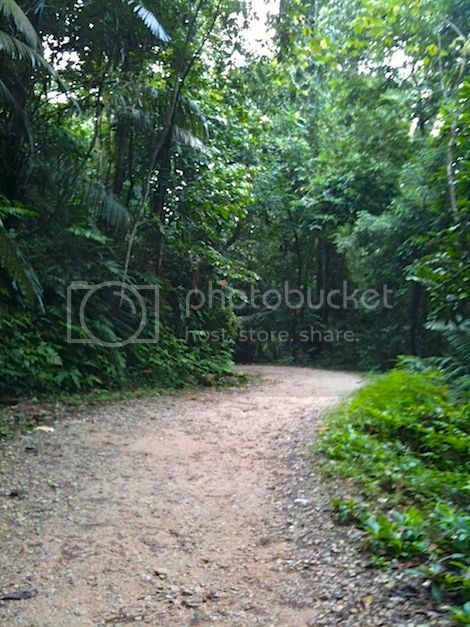 This time, I did not run but just stroll leisurely to enjoy the forests and the fresh air. 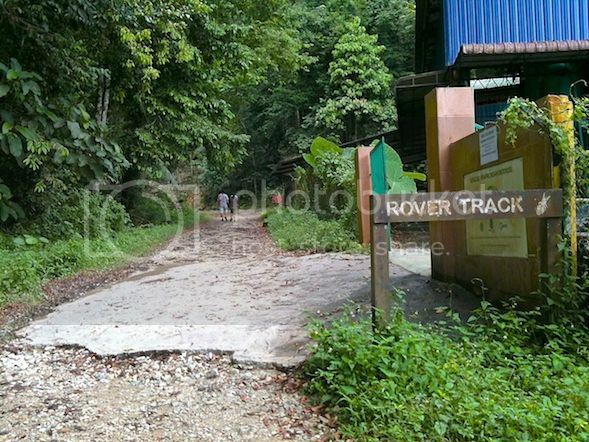 After walking on the Rover Track for about half an hour, I reached the base of the Canopy Walkway. From here, it's mostly uphill climb all the way. If you are not fit, you might find it quite challenging as some terrains were quite steep. Make sure you are wearing suitable sports or hiking shoes. A walking stick may be useful to those who experience physical difficulty. Walking up this forest trail also reminded me of a similar but longer climb I made in Cambodia to visit Kbal Spean - the River of a Thousand Lingas. Read about it HERE. That morning, the grounds were quite wet as it had rained the night before. So it was somewhat a bit slippery at certain parts. 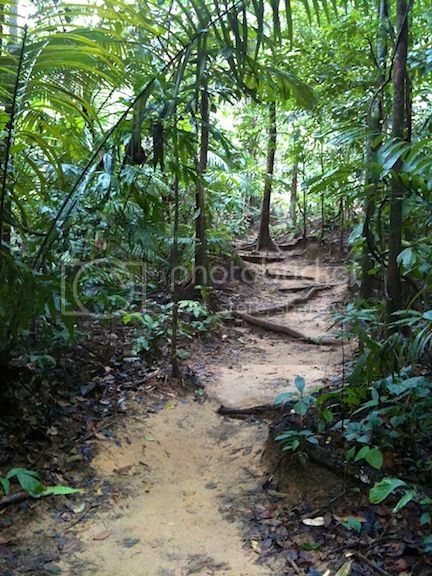 One thing good was there was no leeches at all unlike the forests walk I experienced at Belum Rainforest. 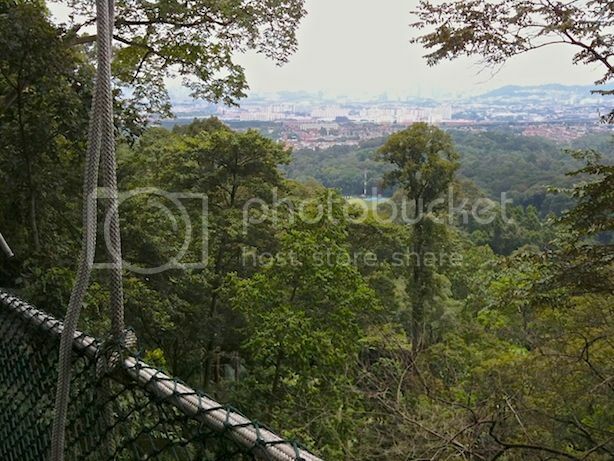 After climbing for about 500 metres, I reached the Canopy Walkway. 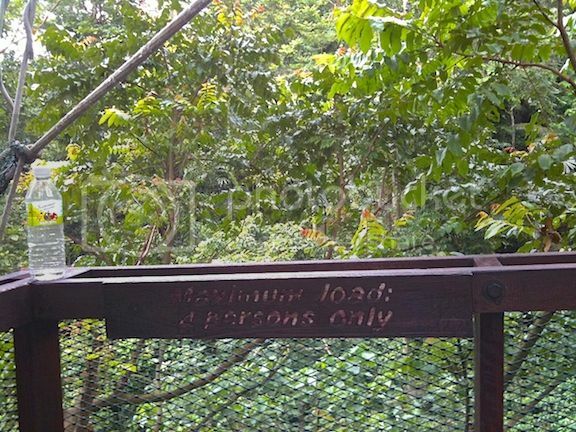 Here, there's a person that will check your ticket before allowing you to walk the Canopy Walkway. This time around, there was a group of students walking the suspended bridge ahead of me. Luckily, they did not linger long because I wanted the whole bridge to myself haha!! I was quite surprised that I did not experience any fear of heights even though I was high above the ground and the bridge seemed a bit wobbly when I walked on it. 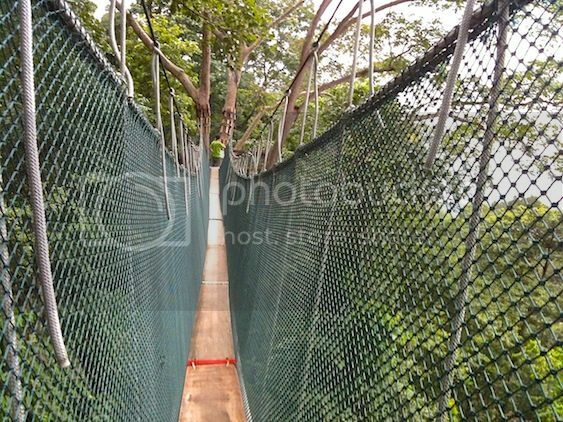 I guess the netting that reached above my waist on both sides of the canopy walkway made me feel safe. 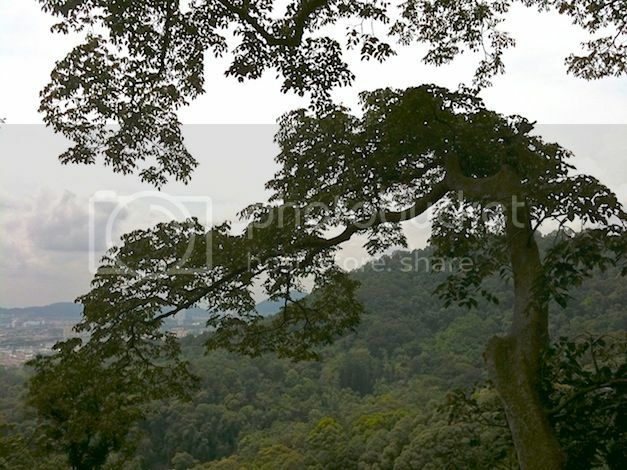 I even managed to take a short video while standing among the tree tops at the middle of the canopy walkway. Watch my Instagram video HERE. 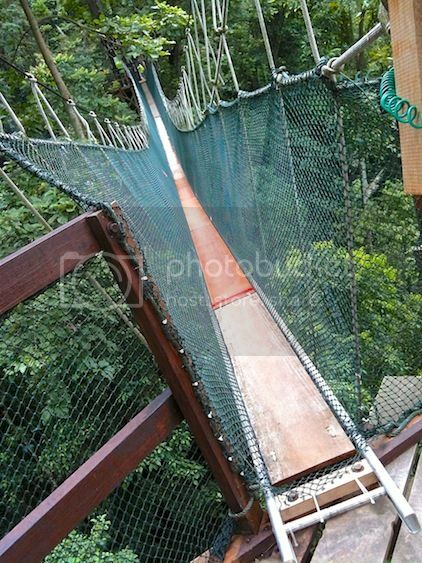 There were altogether 3 platforms along the 150 metres Canopy Walkway. The first platform could only accommodate a maximum of 4 persons. 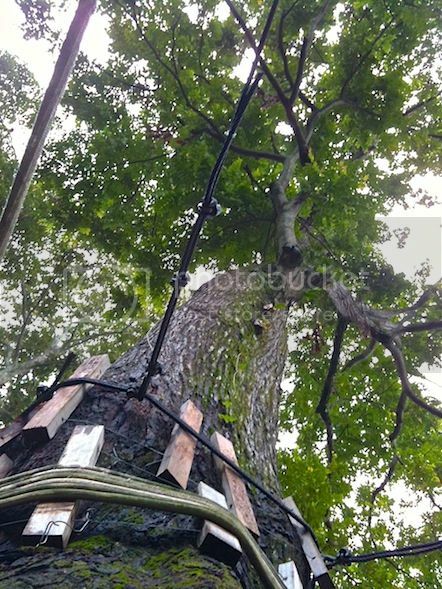 At this platform, I took a photo of the tree above me. 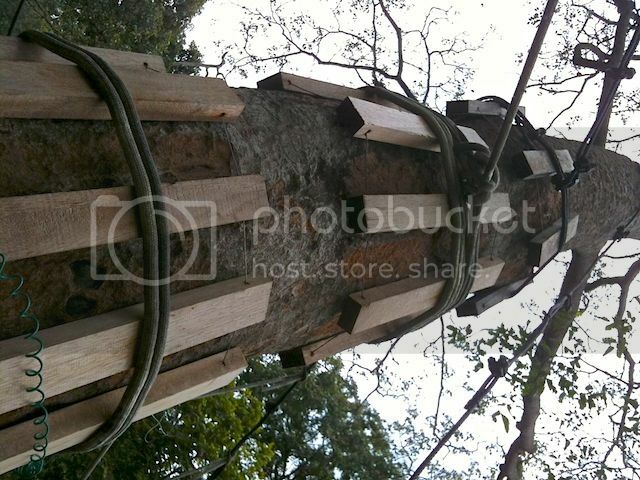 See those wooden blocks around the tree trunk? I wonder if they were meant to protect the tree? I continued to walk the suspended bridge towards the second platform. Do take your time to observe your surroundings when you are on the bridge (that is, is you are not too pre-occupied with your fear of heights!). If you are lucky, you may just be able to spot birds and small reptiles. I soon reached the second platform. Unlike the first platform, the second platform could accommodate up to a maximum of 8 persons. Here, the view was pretty nice! I took a similar photo back in 2009 and that photo created some kind of interest due to the image of a ghost on the tree trunk. Let me repost back that photo. Here it is - Can you see the image of a female ghost in dark glasses in the old photo below? 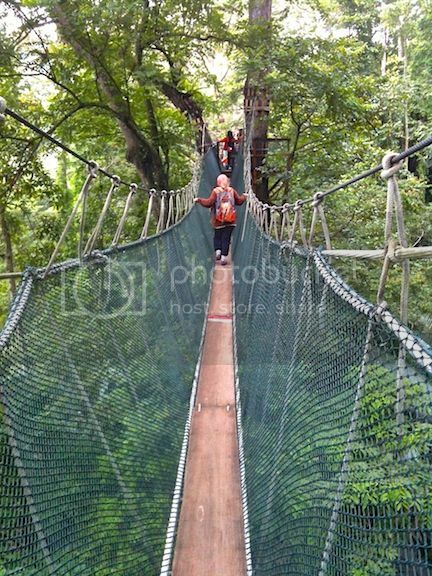 I have to say this is another reason I revisited FRIM Canopy Walkway - to check out the ghost LOL! Anyway, there was no ghostly image in the photo I took last week. I believe the old photo is just a lighting trick. What do you think? But look at the the two photos above again. Can you see that the older photo was more beautiful? And it was taken with my old Sony Ericsson mobile phone. How come it was better than the recent photo taken using my iPhone 3Gs?! Besides the stunning view, I also took photos of the wooden plank that I walked on. So this is how it was done. Without the wooden plank, you would probably be walking on just the net - that would make your walk very unstable! 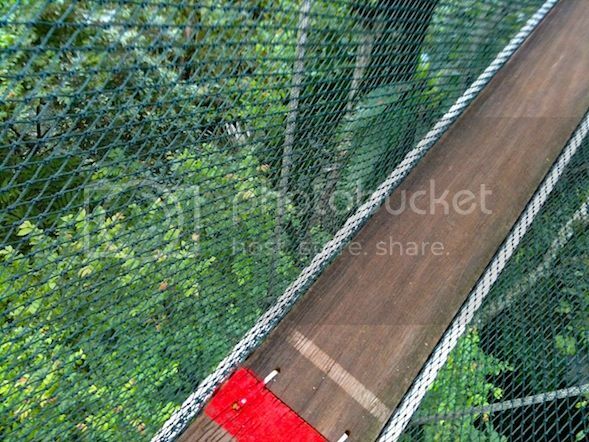 The ropes and ladders of the Canopy Walkway are all tied to and supported by trees. 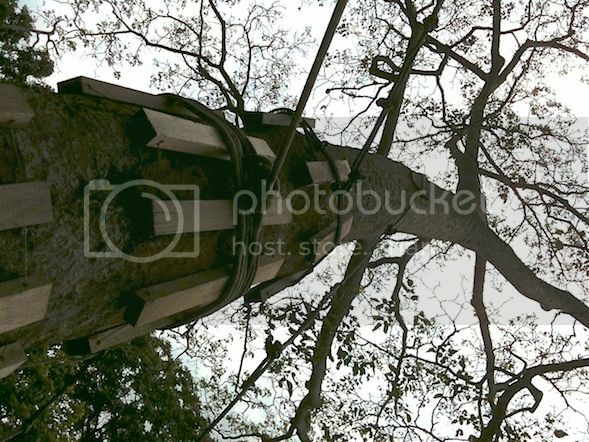 So the health of the trees are very important as the Canopy Walkway totally depends on the trees. Perhaps that is why I saw these blocks of wood surrounding the tree trunk to protect the tree from the stress created by the ropes tied around it. I spent some time on the second platform before moving on to the third and last platform. 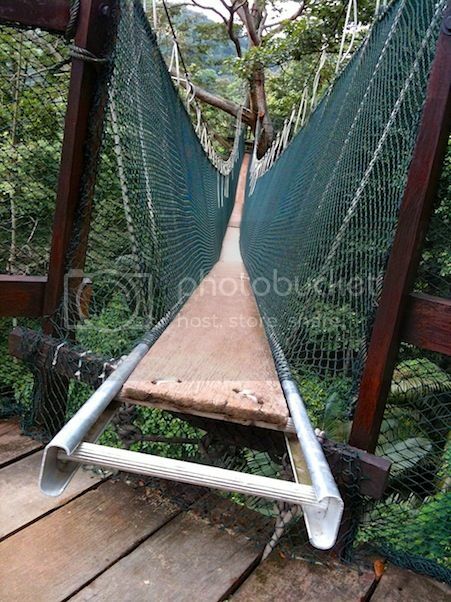 Do you dare to walk this bridge if there is no netting on both sides? I will never dare attempt it! LOL! I actually crouched down to take this photo below. That's why you can see the netting on both sides so much higher. Luckily I was the only person on the bridge and was not blocking anyone haha! 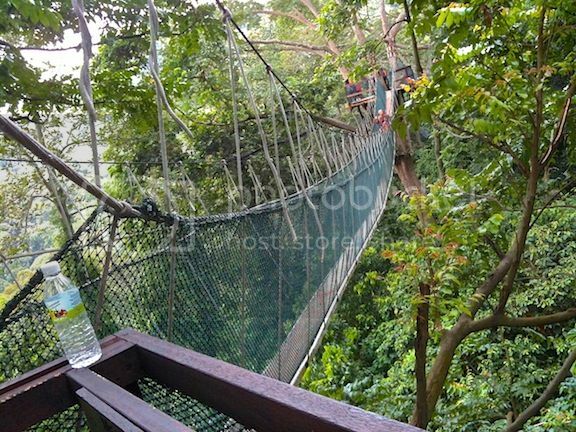 My adventure on the Canopy Walkway came to an end with the third platform. This third platform could accommodate up to 4 persons like the first platform. No photos here, but I took a short video of the third platform leading to the stairs to exit the Canopy Walkway. Watch my Instagram video of the final platform HERE. 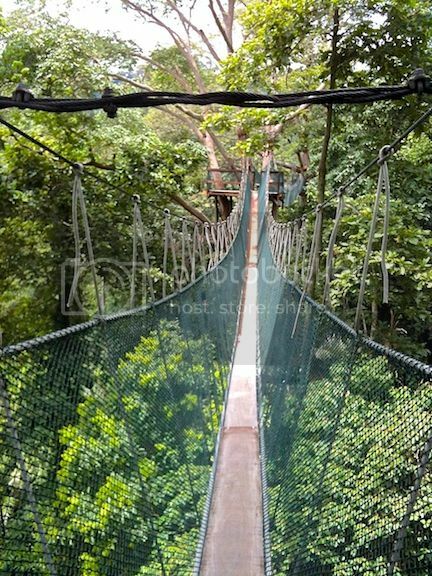 If you are interested to visit FRIM Canopy Walkway, do take note that its operating hours are from 9.30am - 2.30pm everyday except Mondays and Fridays. It's also closed during rain and stormy weather. For enquiries or bookings, contact FRIM's One Stop Centre.